The 1916 D Mercury Dime is a rare and valuable coin. With a mintage of under 260,000, this coin is highly sought after and is usually sold for high prices even in low grades. Because of this, it is a favorite coin for counterfeiters to attempt to recreate. 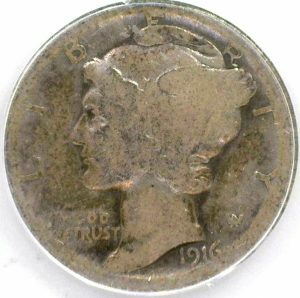 Because 1916 Mercury Dimes minted in Philadelphia have no mint mark and there were over 20,000,000 minted, they seem to be the perfect candidate for the ruse. 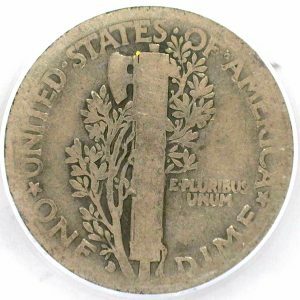 Counterfeiters add a D mintmark to the Philadelphia 1916 in hopes to pass it off as a genuine 1916 D.
While these coins may fool an unsuspecting buyer, an authenticator is not so easily fooled, by looking at the mint mark and other features of the coin, they can easily tell if it is forged or genuine. So if you find yourself in possession of this coveted coin, it is well worth your while to have a professional check it out and verify it’s authenticity.